After installing iOS 11 I can't listen to music. Apple Music keeps crashing everytime I open it. I've tried restarting, syncing music again, even re-seted my whole iPhone but nothing seems to be working. The upgraded iOS 11 has brought great convenience and new features for Apple devices users, but minor bugs and new problems as well, and one of the most common one is the crashing issue that a great number of Apple Music users mention in forums and communities just like the lead-in case. 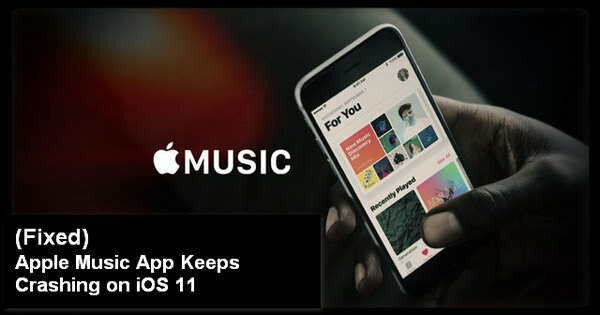 How to fix Apple Music App crashing / not working issue on iOS 11? Move on and you will get it fixed. For iPhone 6 or earlier, please press and hold the Power button and Home button at the same time till you see the Apple logo. For iPhone 7 (Plus), please press the Power button and hold the Volume Down button at the same time till the Apple logo appears. For iPhone 8 (Plus) or iPhone X, please quickly press and release the volume up button, then press and release the volume down button and finally press and hold the Power button and wait for the Apple logo to come out. Press the Apple Music App icon and hold on till you see “X” on the top left corner. Tap “X” and select “Delete” in the pop-up confirmation window to uninstall the app. Now go to App Store and download the music app to check whether the problem persists. If there are tons of songs, videos or apps in your iPhone, please go to Settings > General > Storage & iCloud Usage > Manage Storage to check the storage status of your device. If your iPhone is short of storage, please clear your iPhone memory and free up some space and then run the Apple Music App to check whether it is able to perform normally on iOS 11. Many users found out that the Apple Music app would work properly when they disconnect all network or put iPhone in Airplane mode. Thus you may try resetting the network settings. Just go to Settings > General > Reset > Reset Network Settings. Change your Apple ID to other country and then launch the music App. When it asks you whether to sign for 3-month free trial, just click on "No". You will then be able to play Apple Music directly. Switch back to your original region after a few hours and you may find your Apple Music not crashing any more. Get tired of fixing the crashing issue? Here we recommend an awesome way which enables you to enjoy your Apple Music without Apple Music App. Apple Music is a streaming music service offering DRM-protected songs, for which we are limited to enjoy Apple Music songs with Apple Music App or iTunes. Here are some tips on how to decode Apple Music to a DRM-free format, download and transfer them to be enjoyed anywhere else we like, without Spotify App. What we need is a powerful Apple Music Converter. Let’s take the most popular program – NoteBurner iTunes DRM Audio Converter as an example. NoteBurner iTunes DRM Audio Converter is an expert in removing the DRM from Apple Music, audiobooks & iTunes M4P Music and convert them to MP3/ AAC/ WAV/ FLAC with lossless quality. The program supports the latest version of Windows & Mac OS & iTunes and provides lifetime free updates and technical support. Here are the simple steps to apply NoteBurner iTunes DRM Audio Converter to stream and download songs from Apple Music to our local computer: 1) Download NoteBurner iTunes DRM Audio Converter; 2) Upload Apple Music to the program; 3) Customize output format (MP3/AAC/FLAC/WAV) and output path; 4) Press button "Convert". For details, please refer to Apple Music and DRM: What You Need to Know. Soon all the Apple Music we get will be in DRM-free format and we can enjoy them free and freely.